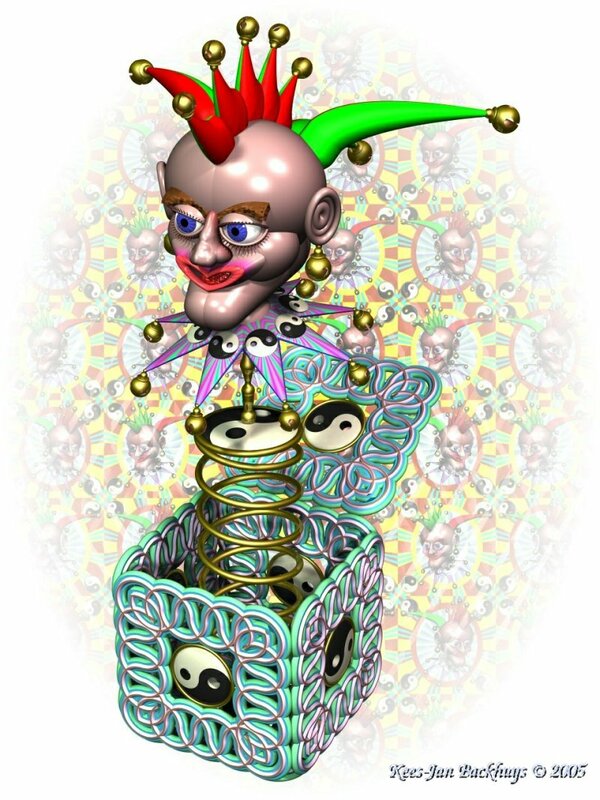 POVCOMP 2004: Viewing Page for "Jack in the Box"
A Jester jumps out of an ornamented jack-in-the-box, laid in with yin & yang figures. This is one example of the output of the "box macro" that I wrote in POVRay 3.6 - It contructs boxes with external ornamental edges of all possible orders (in this case an edge of the 2nd order, but any order >= 0 will do) and any given inlay (in this case a Yin &amp;amp; Yang-logo) but it can be anything, as long as it fits into the square opening in the box. In other words: this picture can be remade in any given type of box that the box macro can produce. That makes this picture one of many in a series, all with different orders in the ornamental box. 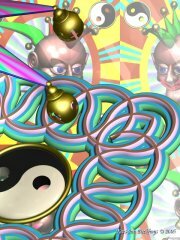 It is only due to the limitations of my crappy old (and therefore slow) computer (75mHz) that I have not been able to submit another completely different one from the series as another entry for this competition. The image maps in the background are also raytraced. 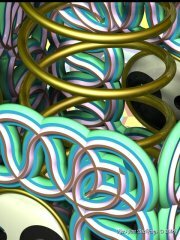 These files are raytraced first and then the output results are used as input for the main picture. Paint Shop Pro 5 for the conversion of the output files to JPEG.